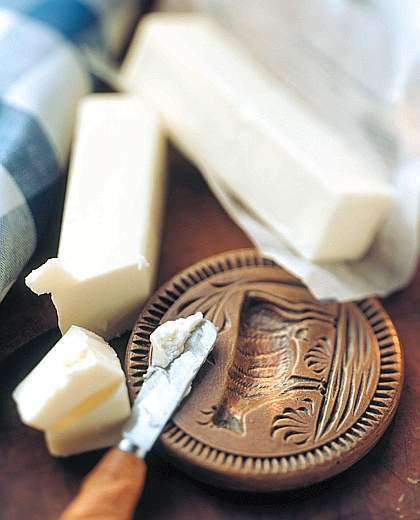 In Valle d'Aosta region you can find several kind of butter, all considered typical product. One of these is the Brossa butter. The Brossa is a fatty substance obtained by acidifyng the whey residuating from the production of the cheese, that can also be enjoyed au naturel. Let stand for a whole day, the brossa is collected and processed with a little water to obtain grains of butter. At the end of the production process, the pats of butter are placed in traditional prints and then wrapped. This excellent butter has a pale yellow color with aroma and flavour enhanced by enveloping sweet and aromatic reminiscent of the milk and hay. His texture is firm and compact to the refrigerator temperature. The Brossa butter is great to be served on the hot polenta. It is also used in the preparation of fried as well as to complete sauces and to whisk risotto. In addition to Brossa one, in Valle d'Aosta are produced various other tipes of butter. There are also the beuro (obtained by autocrop), the beuro de crama (with the add of cream), the beuro colò (melted butter) and the centrifugated butter of whey.